You’ve probably been inundated with many articles on how to stick to your resolutions or kick off a weight loss or exercise program for the brand new year ahead. Instead of hitting you with more tips (but if you’d like them, you can find them here), I’ve created a list of healthy staples with which you should stock your pantry. If you’re detoxing the junk from your cupboards, here are the staples to have on hand for regular use in cooking and baking. I’ve also included my quick meal staples: foods you can have on hand to assemble into easy meals if you’re in a pinch. Coconut oil: I use coconut oil for my primary cooking oil. It’s a saturated fat that’s solid at room temperature, making it incredibly stable when heat is applied. It won’t break down and oxidize like monounsaturated fats such as olive oil. I love this tub of coconut oil. Always choose virgin, unrefined coconut oil. If you don’t like the coconutty taste, you can use refined, but the refined oils do not offer the same health benefits of unrefined/raw coconut oil. I love coconut butter to use in baked goods, as a spread or as an energy-boosting afternoon snack. Nikki’s coconut butter offers a delicious line in flavors like vanilla cake batter (my favorite). Artisana’s coconut butter is delicious and raw. Extra virgin olive oil: I like California Olive Ranch olive oil . Be aware that many olive oils have been cut with soy and vegetables oils, so make sure what you’re buying is true olive oil. Olive oil should be used for low and medium temp cooking. I also like the flavored olive oils infused with garlic, basil, or lemon. Ghee: I like Organic India ghee. I also keep lard and tallow on hand occasionally, and I buy it locally here in San Francisco from The Fatted Calf, which makes both from local pigs and cows. I always have raw kraut (a must for probiotics, detox support and enhancing digestion) in the fridge. It lasts for months. I use Farmhouse Cultures, which I get at Whole Foods, but you can make your own or buy local. Chia seeds are great in baking for egg replacement or to make pudding. They’re high in omega 3s & fiber and are also great in smoothies. I like almond butter and tahini for snacks or in smoothies. You can make your own using soaked almonds, which is the optimal option, but Artisana’s raw almond butter is a good store-bought brand. I use raw apple cider vinegar as a rinse on my hair to normalize scalp PH. I also drink it diluted with water to support good digestion and detox. I use balsamic vinegar mixed with olive oil as a salad dressing. You don’t need to use store-bought salad dressings that are made with toxic vegetable oils. I like to have raw, unfiltered local honey on hand. If I’m not sourcing locally, Really Raw is a great brand. Lara bars or paleo bars are good to have on hand for quick snacks, and they keep for months or longer. I keep supergreens blends around to use in smoothies. They contain mineral-rich and antioxidant-rich veggies and sea veggies like chlorella and spirulina, which also aid in detox. For smoothies, I like PaleoMeal or PaleoMeal dairy free. And I also make sure to keep gelatin around for snacks and for use in smoothies. Click here to read about gelatin’s amazing benefits. This coconut milk (which I use as my primary dairy free milk in smoothies and in cooking) is BPA-free. I always have canned pumpkin because I’m crazy for pumpkin, and I love pumpkin porridge, pumpkin smoothies, and pumpkin baked goods. This one is PBA-free. I am a huge tea drinker. I always have green tea, matcha, Tulsi tea, Yogi bedtime tea and Yogi detox tea. Click here to read about the benefits tea offers. Here are 7 benefits of matcha. I primarily use a combo of almond and coconut flour for baking, and I also use Pamela’s gluten free baking mix. Blanched almond flour is best. Bob’s Red Mill gluten free 1:1 flour works well for more savory muffins or breads. I’ve also used it to make gnocchi, which was delicious. I keep cocoa powder and raw cacao on hand for treats. I use maca powder in smoothies and for these truffles. Maca is a great adaptogen to support your adrenals. For sweetener, I like granulated monk fruit, which doesn’t spike blood sugar or feed intestinal yeast, and coconut palm sugar, which is low on the glycemic index, so it won’t spike blood sugar either. Canned wild salmon is great flaked with dijon mustard over salad greens or inside a ½ avocado for quick meal if you don’t feel like cooking. I don’t recommend tuna due to high mercury, but apparently Wild Planet offers low mercury tuna. Sardines and smoked oysters make great snacks. Sardines are super high in minerals and omega 3s, and smoked oysters are a great source of zinc. I keep wild frozen shrimp from Whole Foods in the freezer, because it’s very easy to defrost and cook up. Just run under hot water for 5 minutes. You can also keep frozen chicken legs and add directly to the crockpot for 6-8 hours on low. I keep organic frozen berries around for smoothies, and I always have sweet potatoes, onions and garlic since they keep for weeks. Always use unrefined sea salt. I get mine from Costco. Celtic sea salt is great for adrenal support. I also buy cinnamon in bulk there, because I use it almost daily in snacks and smoothies. It’s a great natural blood sugar stabilizer. I keep chili powder, cumin, garlic powder, curry, turmeric and baking spices (vanilla, nutmeg, etc) stocked. Cleaning products are full of toxic chemicals that overwhelm your liver’s detox capacity ad build up in your fatty tissues, leading to endocrine disruption over time. There’s no reason to use the chemical stuff. 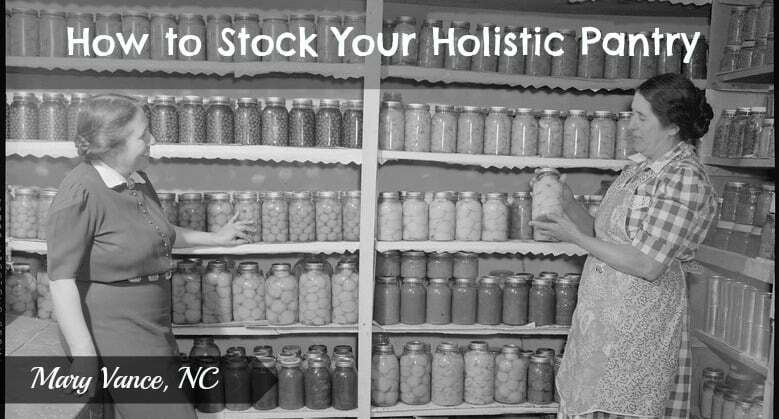 You can make your own easily, or there are many good nontoxic options available. I love Mrs. Meyers. They all smell divine. I use her all purpose cleaner and handsoap. I also like her laundry detergent. You don’t want to wash your undies with chemicals, do you? I use my crock pot, cast iron, and green pans for cooking. Essentials! Click here to visit my shop to see the other cooking utensils I have on hand. Like what you read? Please share and +1! Never miss a post! Please join my mailing list.